Coming from Melbourne Australia in 1980 with two young daughters, Lorri Silver was immediately attracted to Tzfat. A single mother whose goal was to find a place to raise her girls, Lorri found a small house in an outlying neighborhood of Tzfat, and settled in. 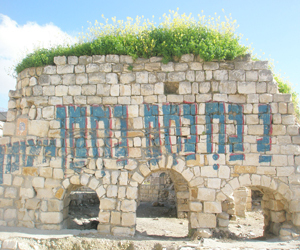 Several years later, she started to think about finding a more central location in the town, and the three moved to the Artists Quarter, next to the Old Jewish Quarter of Tzfat. Lorri wasn't exactly alone with her daughters. A cat, Matilda, had accompanied them from Australia, and was soon enthroned in their new house. Lorri had always felt an affinity for cats, and was pleased that she could raise her daughters with a loving feline. Soon, however, Lorri began to notice the unending stray cat population of Tzfat, many of whom seemed to congregate near her house. Friendliness turned to caretaking, and Lorri and her daughters soon found themselves caring for an endless stream of strays. Black and white, calico and grey, it made no difference - a pitiful "meew" could pretty well insure the cat a warm bed, medical care, and lots of nutritious food for as long as it wanted. "They're all special" Lori has said, and evidently, over the years, dozens upon dozens of cats took advantage of her sympathy for their plight. Lorri's first concern, when a new cat arrives, is its medical care. This is obvious, seeing that an untreated medical condition could quickly cause an epidemic of CATastrophic proportions. A veterinary-friend comes to Lorri's house periodically to treat the cats, neutering and spaying all newcomers as soon as they're old enough. But through the years, Lorri herself has had so much experience that she is able to treat conditions that usually only veterinarians see - ear and eye infections, skin problems and many other conditions. "If they'll let me touch them, then I can usually treat them" Lorri says. "But sometimes, a cat will arrive that won't let me touch it, and it can take months for the trust to build up enough that will allow me to touch it, much less treat it." Lorri points to Bianca, a new arrival whose early life gave her a deep distrust of humans. "Slowly" Lorri said "I'm gaining her trust, but it will take a long time until I can get her into a cat cage so that we can spay her." Bianca started out on Lorri's roof, where Lorri found her and began to feed her. Now, many months later, she will come into the house, but is still skittish and uneasy. Lorri, however, is unperturbed. "All that's needed is patience" she says "and we have plenty of that". At her height, Lorri had close to 30 cats living in and around her house. As her daughters grew to adolescence, their infatuation with the cats diminished, but they are now young adults, living on their own, and Lorri lives happily with her furry felines. She will no longer take in an endless number, but still enjoys having a few around. "Now I have five, maybe six, if you count an outside cat" she says. When asked if she'd like another one, a young female calico seen wandering aimlessly through the Old City streets, Lori's ears perk up. "Maybe" she said. "She may be doing perfectly well where she is.....but....well, maybe."